Thumbprint cookies are classics and really easy to make, but I struck gold when I discovered this ginger thumbprint recipe and added a white chocolate topping for a fantastic crispy and creamy cookie! Traditionally thumbprints are basic sugar cookies with a fruit jam topping. 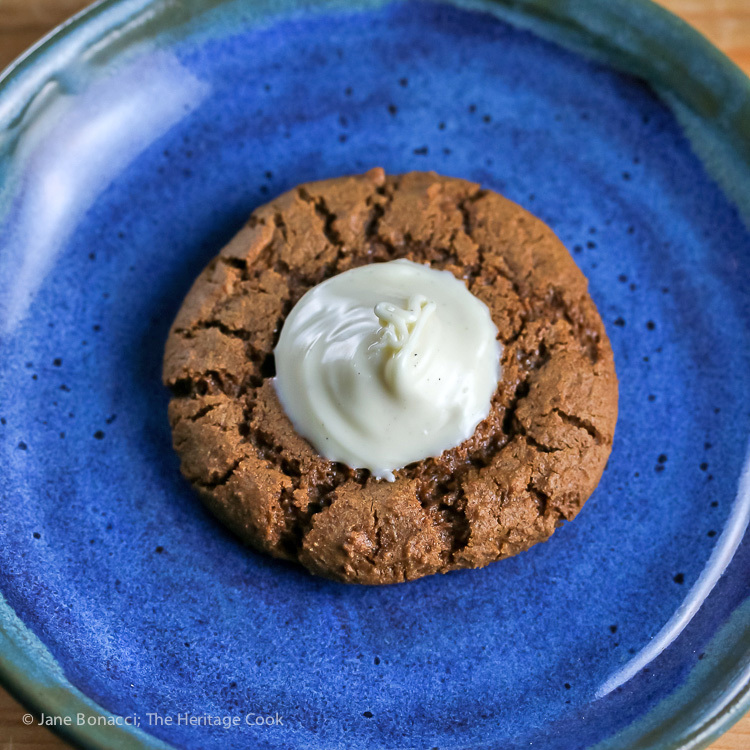 This version is made with a spicy ginger dough that will wake up your taste buds and then topped with a silky white chocolate cream with just a touch of your choice of spice to enhance the flavors. I chose to use cardamom and it was amazing! I am always on the lookout for fun new cookies to make. Something a little different with bold flavors that can compete with a tray full of chocolate brownies and other assorted flavors. Today’s cookies fill all those requirements. While super simple to make (yay! ), these pack a punch of ginger flavor. These crunchy cookies are perfectly offset by the heavenly creamy white chocolate topping. One bite and you will be craving the entire tray! When these cookies are baking, don’t be surprised if memories of your childhood come to mind. It is hard not to feel a bit giddy and silly when you are baking cookies, especially with kids, a remnant of being young and the joy that fills your heart. If you have never worked with white chocolate, it is much more delicate than dark chocolate. You definitely want to use a double boiler when melting it for this topping. And be sure to stir it often. It has a tendency to scorch if it gets too hot. Keep it moving regularly and don’t let the water under the bowl get too hot. It is better to take it a little slower than risk it burning or seizing on you. I found the best method to get the white chocolate into the cookie centers was using two spoons. Scoop up a little and use the second spoon to ease the chocolate into the depression in the cookie. If it looks a little chunky, just swirl it with the spoon and it will soften beautifully. If you are really lucky it will hold the peak as you pull the spoon straight up from the middle! Enjoy these Ginger Thumbprint Cookies and have a wonderful week. Happy Chocolate Monday! If you have long nails, you can use the back of a round measuring spoon or the handle end of a large wooden spoon instead of your thumb to make the indentations. Use a gluten-free flour blend such as the one I use LINK or a commercially available brand such as Bob’s Red Mill 1-to-1 or Pamela’s. Prepare Cookie Dough: In the bowl of your standing mixer, add the butter, sugar, and vanilla. Beat with the paddle attachment until evenly blended and starting to come together in clumps, about 3 minutes on medium. Add the egg and molasses and beat until smooth. In a separate bowl, whisk together the dry ingredients (flour through cloves). Add to the butter mixture and beat on low until combined, then increase speed to medium and mix until slightly lightened and smooth. Take the bowl off the mixer. Use a scoop to form 1 tbsp portions of dough and roll each one into a round ball. Place them 2-inches apart on the prepared baking sheets. Press your thumb* in the center of each one, making a depression, but not all the way through - they need to hold the topping. Bake the Cookies: Place the cookies in the oven and bake 5 minutes, then swap the baking sheets, top to bottom and spin each one so the cookies in front are now facing the back of the oven (this gives you the most even baking). Bake another 5 to 7 minutes or until the edges are firm to the touch. Remove the pans from the oven and using the back of a measuring spoon or the handle of a wooden spoon, gently press the cookies in the centers to make the depressions deeper again (they puff up during baking). Let the cookies cool on the pans for 5 minutes and then transfer to wire racks to cool thoroughly. Make the Topping: While the cookies are cooling, place the chopped white chocolate and milk into a heatproof bowl that fits into a saucepan without touching the bottom. With about 1-inch of water in the pan, bring it to a simmer over medium-high heat. Reduce the heat to medium and set the bowl over the water. Hold the bowl with a hot pad and stir regularly until nearly all the pieces of chocolate are melted. Remove from the heat and stir until completely smooth. Stir in the spice. Use two teaspoons to scoop about 1 teaspoon of the chocolate into the center of each cookie. Let them sit until cooled (if you can stand the wait!) and the chocolate has firmed up, about an hour. Welcome! Unauthorized use, distribution, and/or duplication of proprietary material from The Heritage Cook without prior approval is prohibited. If you have any questions or would like permission, please contact me. The suggestions here are not intended as dietary advice or as a substitute for consulting a dietician, physician, or other medical professional. Please see the Disclaimers page for additional details. This page may contain affiliate links. Thanks for visiting The Heritage Cook!